Wait. What? It's Wednesday again? Already? I'll take it! This past week has flown by in a whirlwind of preparation and enjoyment for and of the Food and Wine Conference in Orlando. I'm just now shaking off the jet lag from Monday, and beginning for form cohesive thoughts. Thank goodness I have one of my ridiculously talented and kind blogger friends dropping by to share a post with you today. Who's Holding the Stick: Today, I'm so excited to welcome the creator of Made with Love Mondays, Tuesday Tutor, and Food Fetish Fridays, Mark of Javelin Warrior's Cookin w/ Luv! Please help me welcome him...and his gorgeous popsicles today. I almost never eat popsicles. So why, of all things, am I sharing a popsicle recipe that doesn't even come close to resembling ice cream? Trust me, I'm scratching my head too. Because even though I made these, I'd still reach for that tub of ice cream. But truthfully, these popsicles exist because I desperately wanted to participate in girlichef's awesome Summer of the Popsicle 2. 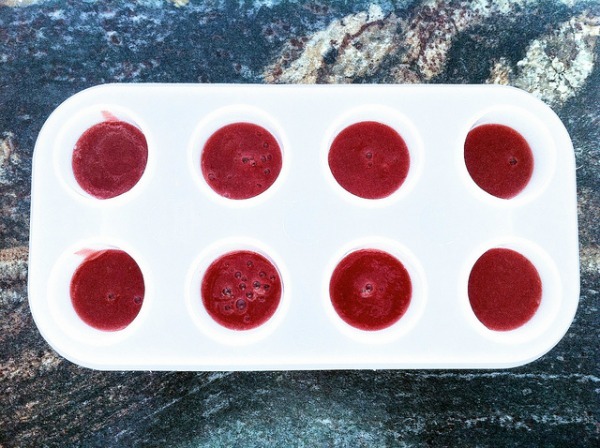 Every Wednesday for the whole summer, different bloggers share delicious frozen popsicle (or popsicle-like) treats with Heather and I felt compelled to make an attempt. I mean really, I should be able to at least attempt making popsicles. Even if I rarely eat them. TA-DA! Cherry Strawberry Lemonade Popsicles! But even if my admittedly inept take on popsicles isn't to your fancy, make sure to check out all the other possibilities over at girlichef's Summer of the Popsicle. Because there are some amazing combinations and nearly every one of them is easy to make. 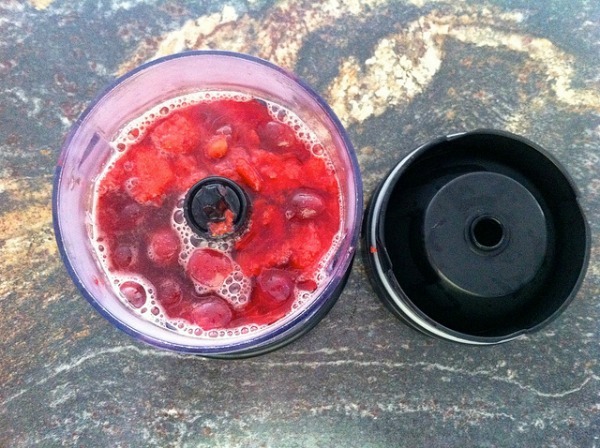 Measure 8 ounces of strawberries and 8 ounces of pitted cherries (I used cherries I had previously pitted and frozen). Transfer to a medium sauce pan and add 1/4 cup of purified water. 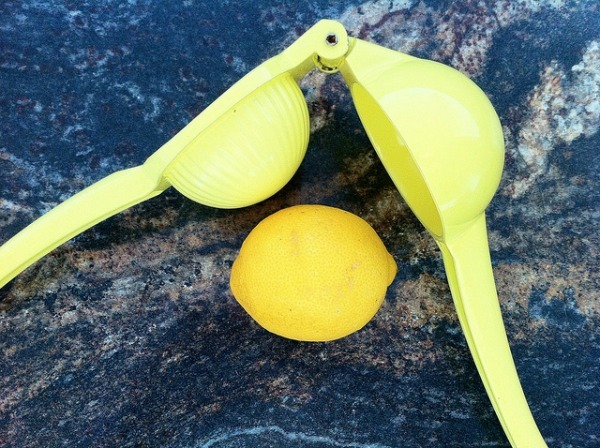 Add the juice of 2 lemons to the fruit. Cover the sauce pan and bring the fruit to a simmer. 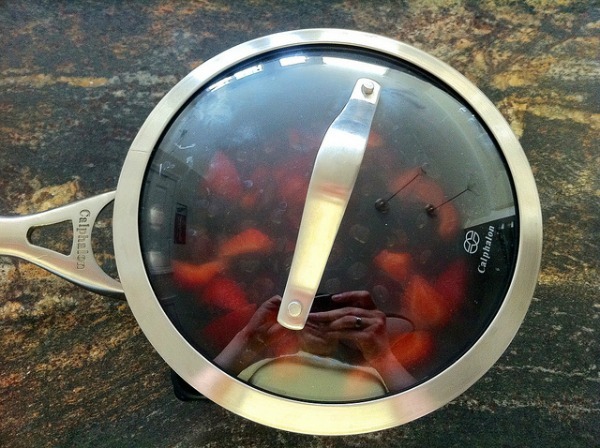 Simmer covered for 20 minutes until the strawberries have begun to break down and the cherries have softened. 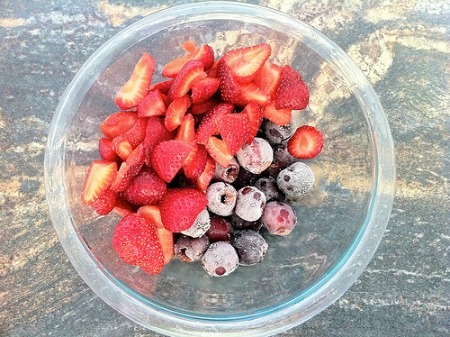 Add the cherries and strawberries to a blender. 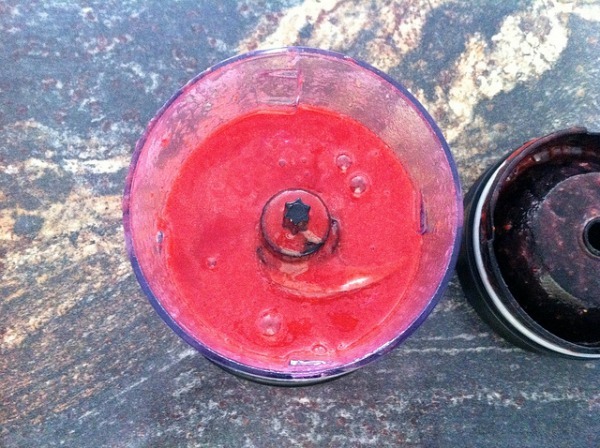 Puree the fruit until smooth. 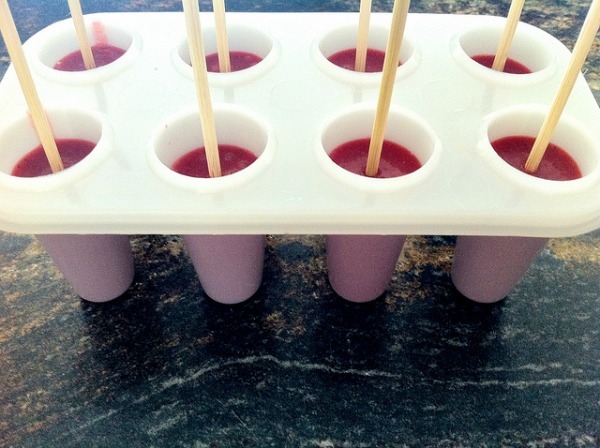 Allow the fruit puree to cool, then pour into the popsicle molds. Add your popsicle sticks, then freeze the popsicles for at least 6 hours (I freeze mine overnight). To remove the popsicles, run the popsicle molds under hot water until the popsicles are loosened. 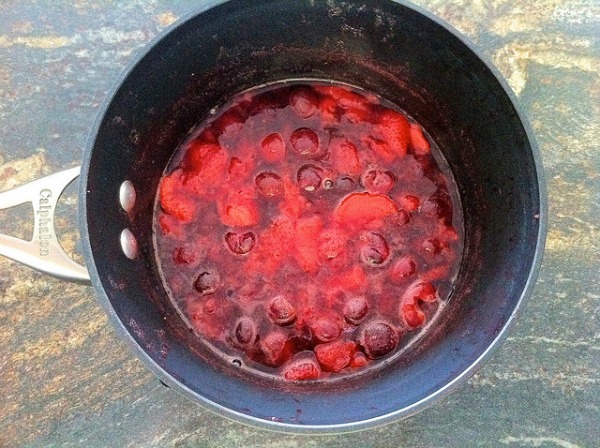 Place strawberries and cherries (I used cherries I had previously pitted and frozen) into a medium sauce pan and add the purified water. Add the juice of the 2 lemons to the fruit. 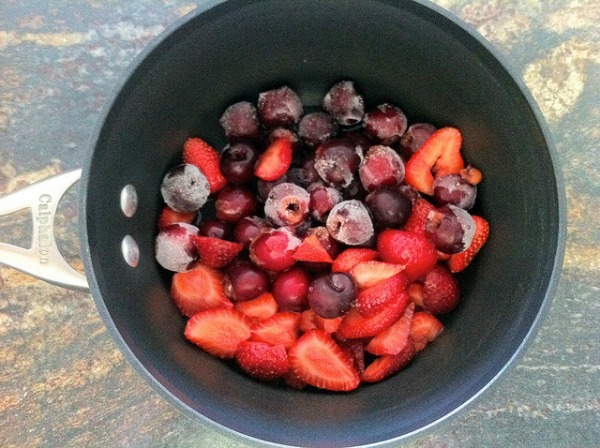 Cover the sauce pan and bring the fruit to a simmer. Transfer the mixture to a blender. Carefully (hold the top down with a kitchen towel) puree the fruit until smooth. 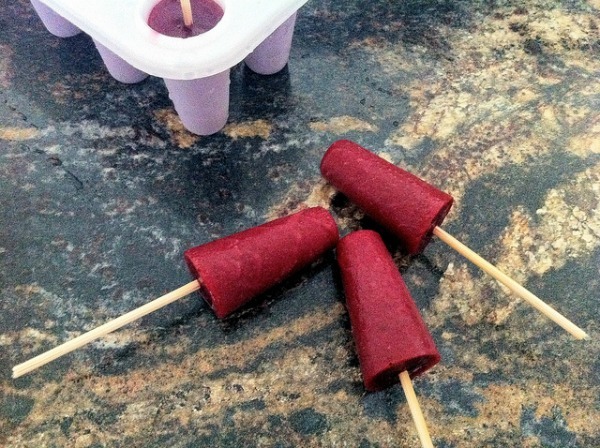 Allow the fruit puree to cool, then pour into the popsicle molds. Add your popsicle sticks, then freeze the popsicles for at least 6 hours (I freeze mine overnight). Sugar: Thanks to the sweetness of the strawberries, you really don't have to add any sugar to these popsicles. And no bottled juice is needed either. So all in all, this is a fairly guiltless snack. Frozen or Fresh: If you start with fresh cherries and strawberries, they will come to a simmer faster. However, you will also have to pit and hull all of your strawberries and cherries. So to make my life simpler, I buy cherries and strawberries when they're in-season or on sale, hull and pit the fruit and then freeze for later. Freeze-time: Unless you like semi-soft popsicles, make sure you plan on a good 6 hours of freezer time. I like to make these a day in advance, that way I'm not tempted to go searching for a treat a couple hours after popping them into the freezer. 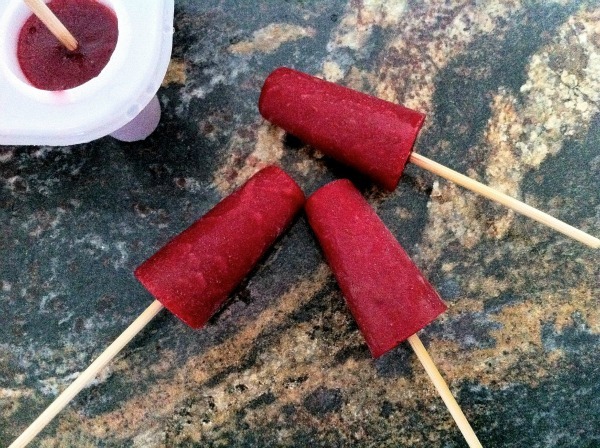 Alternatives: I originally tried these popsicles with cherry and rhubarb (and no lemon). It was a good combination, but Boyfriend Javelin wasn't happy with the flavor. I've also tried swirling in about 1/4 cup of non-fat Greek yogurt to the cooled fruit puree before pouring into the molds. This also works nicely, especially if you prefer a creamier popsicle. Well Mark, I can hardly fault you for reaching for cool, creamy ice cream now, can I? Hardly. I mean, I'd never turn an ice cream treat down. But me and my cold, refreshing, icy pop-lovin' self would never be able to resist grabbing the stick to one of these gorgeous garnet beauties! You may not be a convert, but I'm so happy that you took a bit of time to explore and test so that you could be a (fabulous) #SummerOfThePopsicle guest host! If you're not familiar with Javelin Warrior, I hope you'll take some time to drop by and say hello at his blog. You can also find Javelin Warrior on twitter, pinterest, google+, facebook, and instagram!